With summer on the way, the city’s best-known shopping street is primping itself for its busiest time of year, with more than a dozen new storefronts opening on Newbury Street. The Back Bay business climate has been improving, says Brendan Carroll, director of intelligence at Perry Brokerage Associates, a real estate firm that leases in the neighborhood. Big corporate players like Wayfair and DraftKings are signing commercial leases for office space in the neighborhood, and new condos are coming on the market. That means more foot traffic for shops. “It’s very likely that Back Bay is at its all time population peak,” Carroll says. To further encourage that foot traffic, three Open Newbury Street days are scheduled — for July 8, Aug. 12, and Sept. 9. On those days, the street is closed to vehicular traffic. And while there still are empty storefronts along the expensive block — the turnover rate is one of the highest in the city — here’s a look at what’s new on Newbury. The couture clothier opened its first Boston pop-up location earlier this spring, and will sell a cross section of its most popular designs, chief executive Alex Bolen says. “We are offering a full complement of our services, everything from stopping in to pick up a sweater to ordering a full custom ball gown,” he says. The store has also been hosting trunk shows for its bridal collection and events with local Instagram influencers as a way to attract customers. “The Boston shopper knows Oscar de la Renta, and there’s definitely an affinity,” Bolen says. The pop-up will be open through June 30. Tea Forte at 91 Newbury. 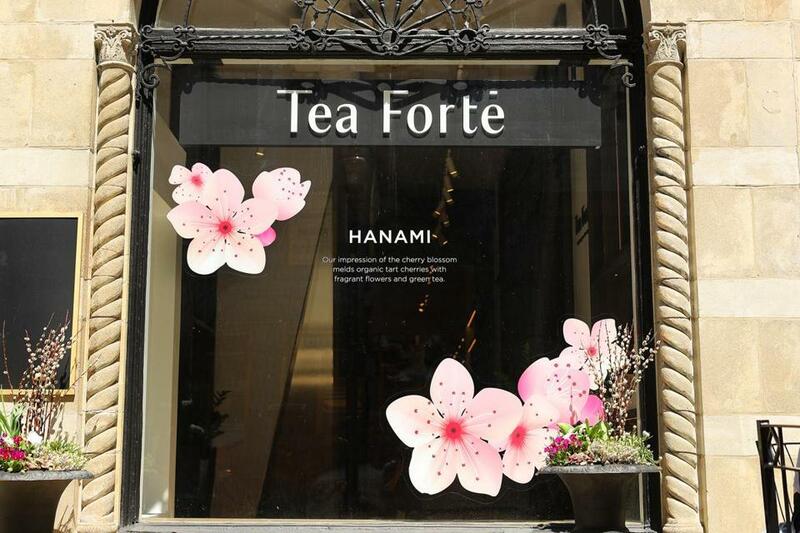 Tea Forte sells 93 types of tea and features a tasting table where customers can sample fun flavors like caramel nougat and raspberry ganache. The Concord-based company, known for its pyramid-shaped packaging, grew to prominence by distributing teas to high-end hotels. Now, after a successful pop-up in November, the company has opened its permanent first brick and mortar shop. Owner George de Mello, 31, has been cutting hair on Newbury Street since he was 16, snipping tresses at Salon Mario Russo, G20 Spa + Salon, and Emerge. He hopes to “bring back the luxury to the salon industry” with his boutique, which has its official grand opening in July. Clients get one-on-one attention in his private VIP suite, de Mello says, and can choose from an array of services, including laser treatments and skin-tightening sessions. He’s also a brand ambassador for Balmain’s new line of hair care products and is the only salon that carries them on Newbury Street. This salon offers blingy nail designs, caviar hair treatments, and Barbie-worthy eyelash extensions in a sleek, modern setting. The former 2nd Time Around founder Jeff Casler returns to his original Newbury Street flagship store with a new venture, Thrive Exchange. The concept emphasizes vintage streetwear over couture, and the shop works with a network of buyers who specialize in throwback jerseys, rock T-shirts, and classic sportswear. “Consignment as we know is done,” Casler says. Caffe Nero seems to be everywhere in the city — the chain now has 21 restaurants operating in and around Boston. Its newest will be a 2,400-square-foot Newbury Street outpost that will feature patio seating. The office offers nonsurgical cosmetic treatments, injections, fat-reducing coolsculpting sessions, and other procedures. The rolled ice cream trend, which started in Thailand, arrives on Newbury Street this summer. It features ice cream thinned out on a super-cold metal surface and then rolled around a variety of mix-ins. The beachy apparel brand Chubbies opened its first Northeast outpost on Newbury Street in March and plans to stay open through December. Best known for its cheeky marketing, the brand’s colorful shorts, Hawaiian shirts, and swim trunks are beloved by frat boys. But the store also recently began offering women’s styles, including windbreakers, one-piece bathing suits, dresses, and loungewear. The ground floor of luxury hair salon Safar Boston is being renovated to accommodate the city’s second Serafina restaurant, which features modern Italian cuisine. The businesses will share a patio space. Sacha Safar, son of the salon’s owner, Serge, answers the obvious question: Can guests eat pasta while they wait to have their haircut? “I don’t see why not,” he says. The European men’s fashion line Suitsupply will open its first Boston store on June 7. It will also operate a ground-floor restaurant, Café Susu. City Smoke Shop at 324 Newbury. 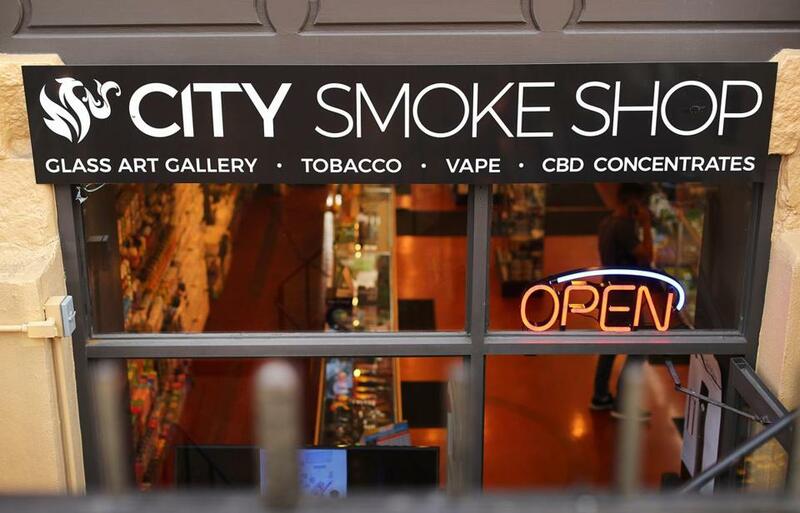 City Smoke Shop, which opened earlier this year, features smoking products and accessories like glass pipes, cigarettes, cigars, vapes, and of course, Juuls. They even cater to nonsmokers with THC-free cannabidiol products such as tinctures, lotions, and oils, and vapable products. “You put a couple of drops of tinctures under your tongue, and it relaxes you,” assistant store manager Jason Pe says. The Vans streetwear brand will move down the block from 174 Newbury to a larger location on June 7. The new store will offer a wider selection of clothing and shoes, including a line of children’s wear. “The move is going to be a trip — I think we’re all very juiced,” says Ella Pearson, a store associate. 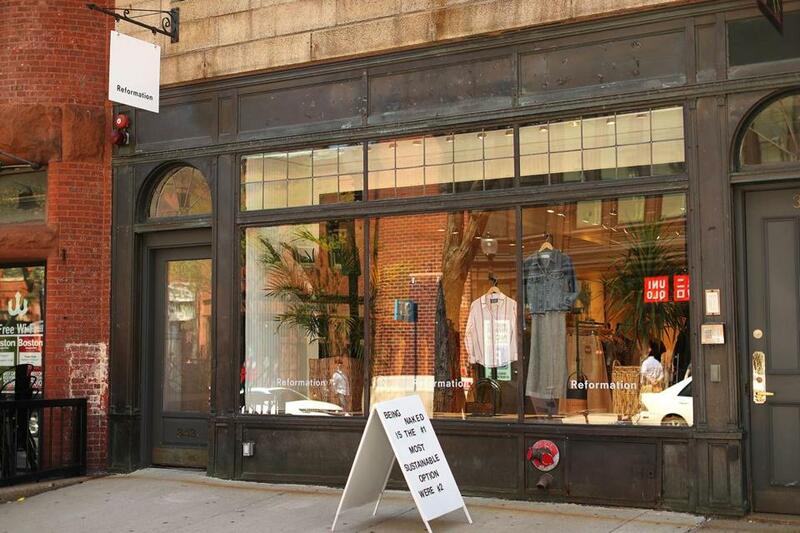 Find floral frocks and jumpsuits at Reformation’s first store in Boston. The Los Angeles-based company, which started in 2009, is known for its environmental ethos, including the use of repurposed vintage clothing and fabrics salvaged from factories. Motion Stretch Studio, 351 Newbury St.
A team of licensed massage therapists use the science of myofascial trigger point release to focus on eight key points of tension in the body to help increase flexibility, strength, and range of motion. “Your everyday function is what we’re all about,” says Marielle Frederick, the studio’s assistant manager. Globe correspondent Margeaux Sippell contributed to this report. Janelle Nanos can be reached at janelle.nanos@globe.com. Follow her on Twitter @janellenanos.